The sculpture is a larger than life size carrara marble sculpture carved by Kathleen Scott, the wife of the subject, after Scott’s death and was erected in 1917. The sculpture holds a bronze pole, patinated dark green and sits on-top of a high granite plinth displaying two bronze commemoration plaques. 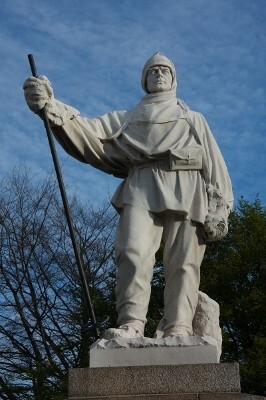 The statue was never completed and the gloves and area around Scott’s leg were left for completion in Christchurch, which never occurred. The sculpture had previously been treated by International Conservation Services to remove a black crust on the surface and staining from the bronze components. There are no major structural concerns, although there is a small crack to the proper left hand side of the head and to the stump at Scott’s left hand foot. These were both present in a 1995 report. There is a large chip on the front below the belt in the centre of the statue and heavy weathering of the satchel. There are some remnants of the black crust in the minor cracks and roughly carved section at the feet as well as under the edge of the coat and glove. The graffiti was assessed and the below image taken of the blue marker pen graffiti prior to treatment. A scaffold was erected around the statue as well as a locked fence to try to prevent further attacks during treatment. Large amounts of the graffiti were removed using swabs of solvents and poultices. After the final poultice was removed the entire statue and base was cleaned with Triton X100 detergent and water on soft bristle brushes and rinsed down with low pressure water. Moss and grass were removed from the grouting by hand.